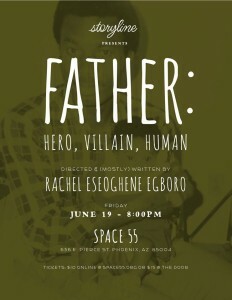 Storyline: FATHER – Hero, Villain, Human. Dan Hull’s Storyline presents a special show Father, curated by Rachel Eseoghene Egboro. Rachel and company will be telling stories of the many fathers in their lives, and the evolution of perception of who that person really is. Storyline: Funny. Inspiring. Motivating. Brutal. Gripping. Always living.